After 31 year-old track and cross country champion Keninisa Bekele’s superb marathon debut in Paris today, 2:05:03 — course record, sixth fastest debut in history, fastest first-time marathon ever by a man over 30 — I thought it would be interesting to look ahead by looking back. After all, records are the lattice upon which the sport of athletics grow, while giving fans a chance to compare and contrast athletes of different eras in much the same way baseball fans compare stats across time (at least until the steroid era kind of ruined that). Before we glance back, however, let us look into the very near future as we await another highly anticipated debut, that of England’s own double Olympic track champion Mo Farah. Also 31,, the 2012 5000 & 10,000m Olympic gold medalist will hope to thrill the home crowd at the Virgin Money London Marathon. 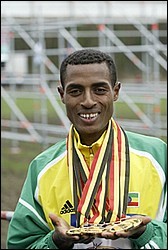 And he will know how high the Bekele standard has been set. But while Paris was a showcase for Bekele with a very good, but not great field, and his manager Jos Hermens riding alongside on a motorbike, Mo will have to negotiate a field of steely-eyed killers, record holders, and Olympic medalists in London. So while Keninisa was able to pull free of his competition after 25k on his way to victory in Paris, one can expect Mo to be challenged much later into London’s 42 kilometer soiree next Sunday. At the same time, London is historically a faster layout than Paris, so it will be difficult to make a direct apples-to-apples comparison between the two. But why should that stop us from having some fun with numbers?